This outstanding workbook is so beautifully conceived, with exercises that are so creative, engaging, and masterful in their ability to teach the basics of English grammar and syntax that I can only imagine parents, teachers and, yes, students cheering as they explore its pages. 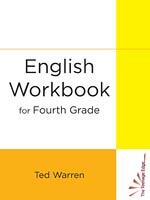 Accompanied by the information the teacher will bring from The Teacher’s Manual for Three Workbooks, students will discover clear rules for punctuation, parts of speech, and spelling. They will also discover how exciting English can be and some of the many wonderful things one can do with it. 96 pages, 8 1/2″” x 11″, 2014.